I love seeing all of the giving/sharing/helping others that happens during the Holiday Season, and this year Random Acts of Kindness seems to be a major holiday theme, which I think is phenomenal. 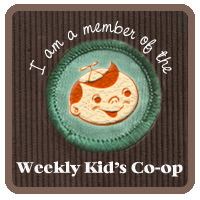 So, I decided to share my favorite posts from the Co-Op last week that featured Holiday Kindness/Giving/Helping Others. Little Wonders' Days shared about participating in a school food drive for their Advent Service Day. 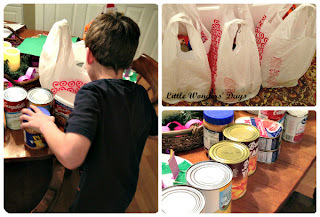 J Daniel 4's Mom wrote about planning a food drive and The Iowa Farmer's Wife shared a great post about 12 Days of Christmas Kindness! Also, I wanted to share an update from the 12 Days of Christmas Giving project I have been involved with for a local family in need. 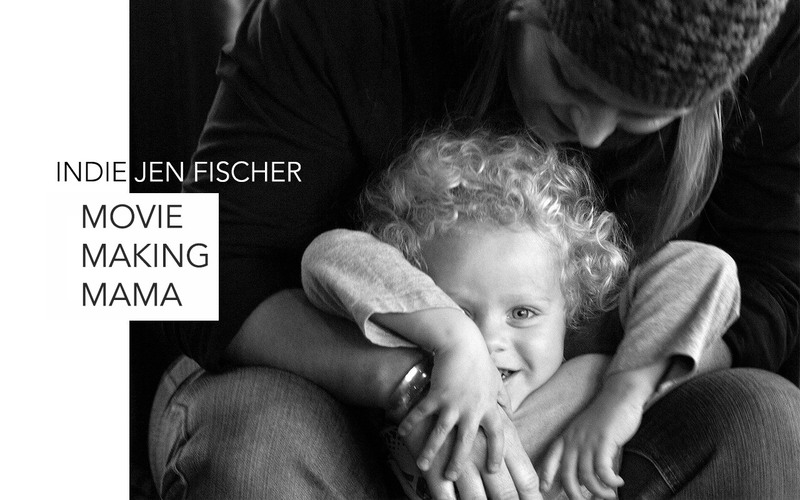 In addition to the blog post, I wrote a local weekly news piece about the family. As a result, someone saw this piece and donated the remaining $7,655 needed for the critical bone marrow transplant that the father (of 4) needs as he battles leukemia. I was blown away by this generous gift and reminded that one small act of kindness (writing an article) can lead to much, much more! I also have a few more RAK posts/activities to share: Coffee Cups and Crayons Random Acts of Christmas Kindness Christmas Countdown is a very cool advent calender alternative that I just love, and the Random Acts of Kindness Family Challenge from All Done Monkey has many posts to get your kindness mojo flowing. 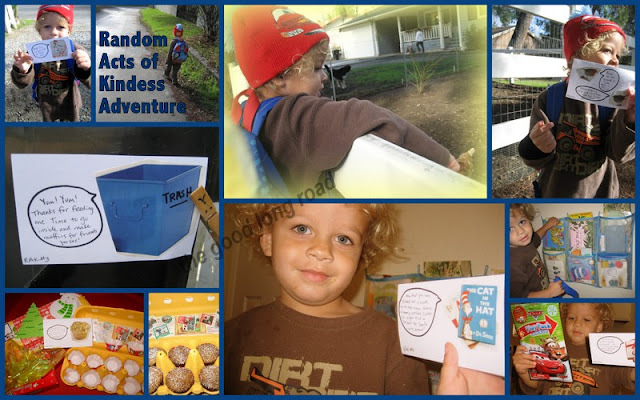 Finally, I am sharing our Random Acts of Kindness Adventure, which kept getting delayed by rainy weather, but which we FINALLY got halfway through today. 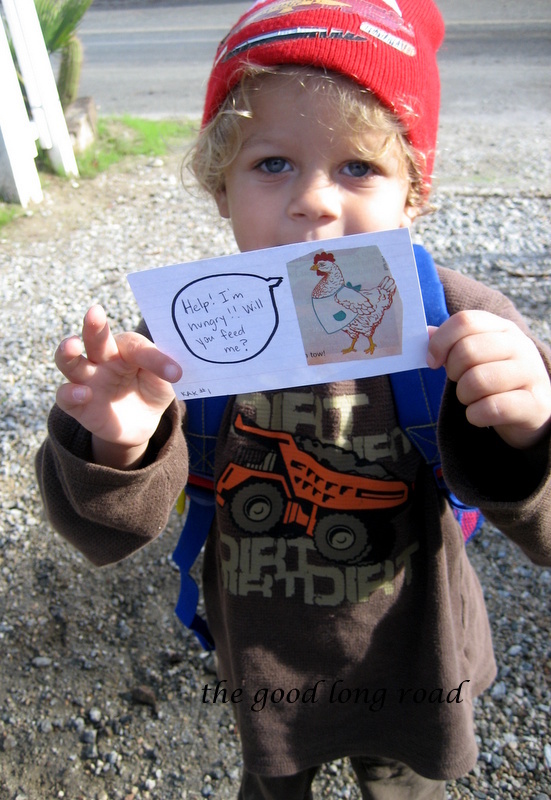 Our adventure consists of 8 special adventure cards each with a fun rhyme related to a different Random Act of Kindness. Our adventure included: Feeding a Neighbor's Chickens, Picking Up Trash, Making Muffins for Family and Friends, Selected Books to Donate, Finding a Toy for a Friend, and Giving Out Candy Canes in our Neighborhood. The cards send Wild Thing along his adventure. Showing off his first card! For example, after we fed the chickens, we discovered the 2nd card with a bag for trash and gloves. The third card was on the trash can. 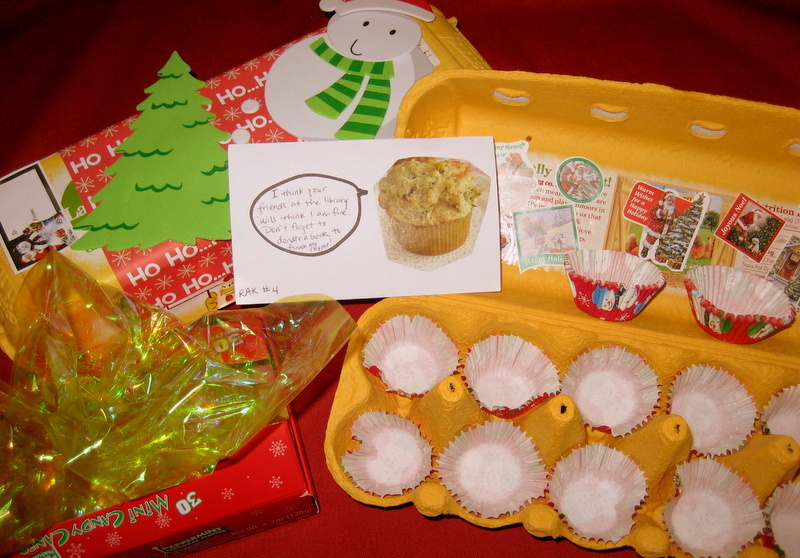 The fourth card was with our muffin making items. A few days before we decorated egg cartons, which he did not know would become our muffin carriers! The fifth card was hiding with his books. The sixth card was in the laundry room where the toy for his friend was hiding. The 7th card was waiting with that toy and the final card is in our reusable gift bag that is full of candy canes, which he will be given when he delivers the muffins to a friend. We are having so much fun along this adventure and cannot wait to finish it tomorrow! 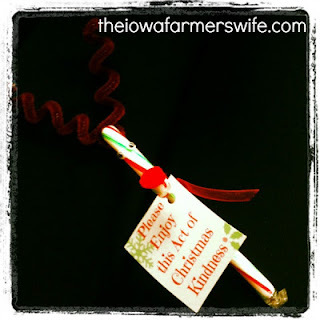 What Random Acts of Kindness have you committed or been on the receiving end of this holiday season? I had someone put my grocery cart away for me last night - I think he realized that getting my 3 yo and 16 month old and groceries in the car in the rain was enough, I did not need to put the cart away too! I was grateful. LOVE all these! We were going to add trash to our list (we have a path by our house), we'll have to do it while we're traveling or in the New Year! Love all the other ideas as well!!! :) And THANK YOU for including our 12 Days of Christmas Kindness! What a great post! Thank you for including us, and I love your Random Acts of Kindness adventures! Fantastic post! And I can't say enough how proud I am of you. You re amazing! I love all of these posts!!!! LOVE your adventure!!! Just fantastic! I love this community and the focus on giving! Woo hoo!